Yes, great work, dear John…! Greetings from Basel, Switzerland. I have been following your work since Amalgamator. Fully agree with John’s consummate analysis. There really doesn’t need to be a single catalyst for a huge decline to take place. The evidence is all there in the charts. This is a multi-decade market top in the final stages of formation. To those who watch the overnight futures, frankly, they mean nothing, other than to those who trade them. I’m withdrawing $500 a day from the toxic banking system and buying physical gold and silver like there’s no tomorrow. All the coiled inflation in stocks will eventually flow into precious metals and commodities. Great work John, and thanks for allowing us to express our views. They mean nothing until they mean something. The fact is that currently futures indicate an open back up near all-time highs for the SPX. Monday’s break was uneqivocally bullish and yesterdays action smacks of a test of the break if we get follow through buying today and new highs. I for one, regardless of howbearish things look, will wait for price to confirm to me when the market has topped and reversed. US-Futures still up and European Indices down, expecially emotional frontrunner DAX. That’s how is has to be and remain to signal in trend change. Dead on. That’s why I bought Leaps for January 2016 puts on the SPX on december 31st. Can’t pick the tops, but it will coom soon enough. Moves generated by underlying exhaustion vs news catalysts are better as they are more real. Allan, Monday certainly looked bullish and most certainly felt bullish. It also looked like a false break-out smashing the poor shorts stops. The market also is in a long term very bearish megaphone formation as well as a short term one plus all the bearish indicators John has pointed out. 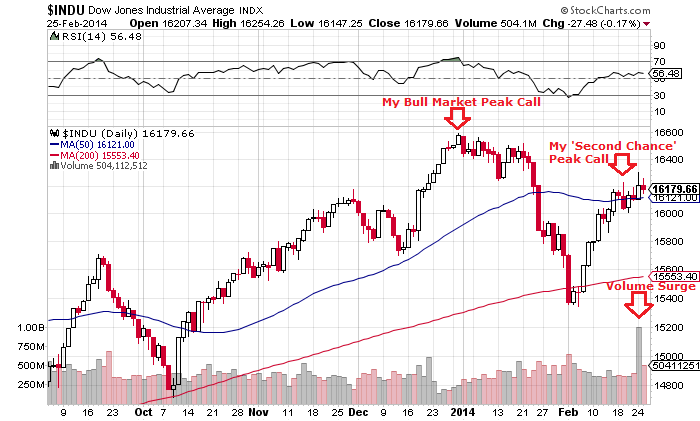 You are absolutely right to wait for price confirmation which per the megaphone a close below 1836 on the S&P. Even doing this during 2000 and 2007, I got beat up pretty good before it finally really happened. Martin Amstrong just published sheets with the weekly signals of his computer program for DOW, gold and euro. A directional change is on schedule this week for all three. Not that this signals are working all the time, but since I’m watching them at least the weekly DOW signals are more often then not correct. The predicted panic cycle for the week 31/03 is also conform with Johns historic comparisons. For what its worth here is another indication, in my opinion, that trouble is on the horizon. The yellow line is the COT Normalized Small Spec net position, when they get very long more often than not SPX is usually near a intermediate to major top. FYI – DeMark calling now for 1885 and no more crash. DeMark is a has been…he’s been wrong for about 200-300 SPX pts now..why he gets any press anymore is beyond me. When Demark started out over 30 years ago he ran a small trading service called Futures Forcast and I talked to him The insights he gave me then I still use almost on a daily basis in my trading. I am glad i talked to him 30 years ago. There are only 4 or 5 market gurus that have been consistently right over long periods of time. ie, don’t be so harsh. 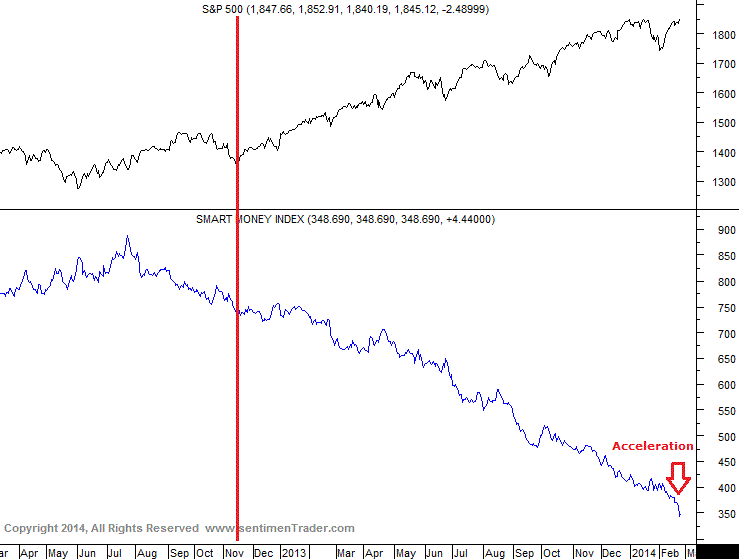 John, any thoughts on high yield debt continuing to show no divergence? 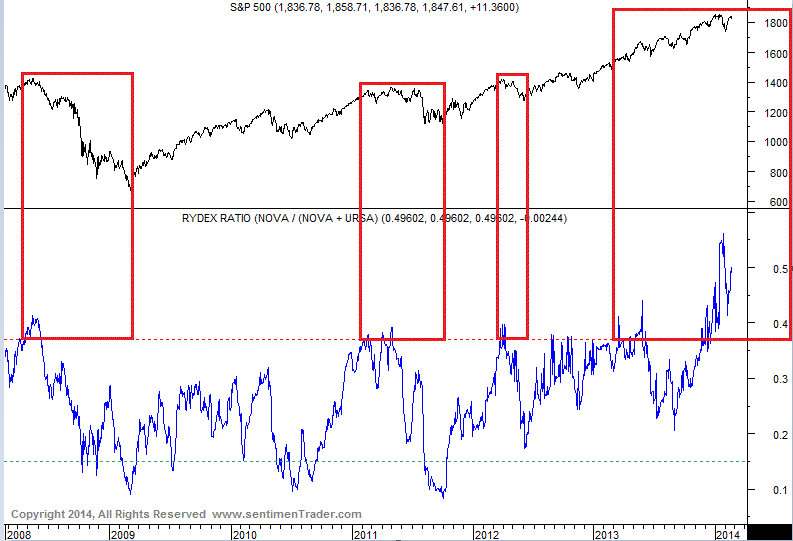 In the past tops it has diverged in price vs SPX. When I looked it didn’t so compelling as a leading indicator. However, I’d add that corporate debt has been driven to historic extremes as investors have piled in, with the corporates then using a signifincant portion of the cash for equity buybacks, encouraging the maxing in equity markets. In short, I see it as part of the problem: investors are all in and all eggs are in one basket: corporates. Yesterday saw another failed breakout attempt in US stocks. I have a case for the market to be rolling over, so let’s see how this week ends. If conversely stocks do muster a breakout close, it would likely be on multiple divergences, and I would expect it to be short lived. I would then look to a roll over after this weekend’s new moon. However, my primary scenario is that downside resumes before the week is out, and if that occurs I would want to see some sharp selling into Friday’s close to set the scene for a potential big down day on Monday. So let’s see. ….how nicely the DAX is paving the way! Futures gone from +60 fair value on the Dow as of 3am EST to -69 fair value as of 6am EST. Could be an interesting day ahead! Good luck all. I’m “Yellen” for a new high. HERE WE GO. Not even the potential for another Cold War can bring this market down. I’m afraid you missed the start of the “Cold” Nato-Russia-China war and won’t believe it, if you wake up in the midth of a very real hot one. This leg up has been brutal. Today’s price action will be interesting regardless. Slater9, can you please expand on pugsma’s expertise and the EWT? I couldn’t find the public post; it all looked like a sub to me. Then I saw your post that it had been withdrawn. Thank you for any additional feedback. Keep in mind that whatever I say about PUGSMA includes that fact that after being an invited poster at his site I was tossed from his site. and it changed my view…The work there is done strictly by the rules AND he ALWAYS has an alternate count…Based on the work there , I now keep my own elliot.I wanted traders to see his charts when he briefly posted then publicly by mistake. They showed the view of the coming top by the best elliot analyst I have seen..I thought traders who are looking to get off the BIG SHORT would like the imput of an analyst who has had this price level and slighty above as his target for years..
What do you advise then? If GLD is fraud, should we still buy it or should we buy the physical gold instead? Kasi, DJ is absolutely correct. The so called “vaults” of GLD and SLV will become crime scenes. They are almost certainly empty of metal. Buy physical metal and take personal delivery. Simon nailed it, Kasi: Buy physical metal and take delivery. Keep it in your own possession. should have seen some weakness but looks like there is always a bid every dip is aggresively being bought. Does this bheaviour change your thoughts. I cant understand whats wrong with your approach it should very much work and positioned accordingly. You are wrong, the market is going a lot higher. I think nasdaq at 6000 and S&P 500 at 2200 are reasonable targets. You should cover your shorts. Hi John! Just want to say thanks for sharing all your great work. I have been reading your site for a long time but never left any comments as my style of trading is very different but none the less I still find your analysis very interesting and of high quality. This is something that is very rare within the financial blog community and I salute you for sharing your work and for being a great man!!! Ultimately I do believe your ideas will play out and the current price action is perfectly logical with the intent of shaking out as many weak hands as possible before price heads down. Thank you for sharing this information. Slater, I have scoured the web to find a consistently accurate EW guy. Was basically disappointed. Do you have an opinion of Neely’s work? You probably know about the following but thought I’d post it anyway in the spirit of sharing info. 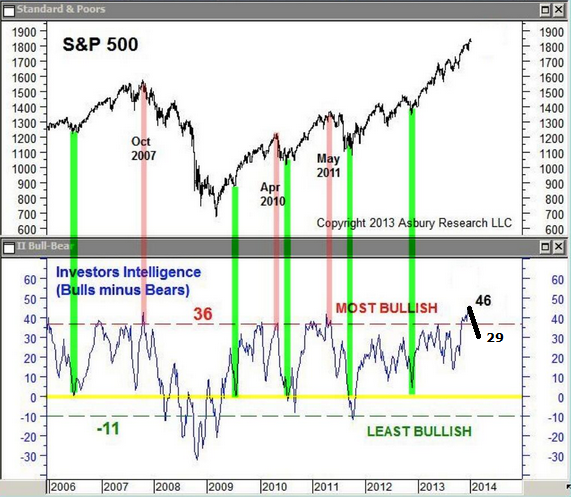 This IMO is the chart the “bulls” need to watch carefully. Unless the Trannies can reverse this higher into weeks end then things could get very interesting next week. Many thanks for your analysis so far. Would appreciate your thoughts after yesterday’s price action. Thanks Matt. Looks interesting, have bookmarked it to have a proper read.